So we're already a few weeks into January and the first major release dates are quickly approaching. There is already building buzz for a packed release schedule featuring albums from some of the biggest names in indie rock, and also some stellar records from some of music's lesser known names. In the first half of the year, records are due from Grizzly Bear, Lily Allen, Animal Collective, The Decemberists, Andrew Bird and M.Ward. Yet, there are formidable challenges to these larger releases in the form of gems from Bosque Brown, The Soft Pack, Girls, Alela Diane, Here We Go Magic, Wavves, Fan Death, Little Boots, Ida Maria, and my current favorite Harlem. While the great records we've heard (and not heard yet) are almost too much to absorb - here are three artists with upcoming records that should not be missed. Andrew and Vince's picks are coming next week. Mine are after the jump. Not matter what the buzz, how great a band looks, where they come from, what label they are on, or who their friends are, it all comes down to great songs. In the most simple terms, that is where the Pains of Being Pure at Heart excel. POBPAH are able to craft perfect 3 minute pop songs drenched in gauzy distortion yet rooted in melody and played with the excitement and passion of a garage full of high school kids. This New York band mines their sound from 80s and 90s rock, successfully melding catchy acoustic guitar progressions with overdrive-laden electric guitar power chords. POBPAH have released a collection of highly acclaimed singles for labels such as Fortuna Pop!, Atomic Beat and Cloudberry. Slumberland will release The Pains of Being Pure at Heart on February 3. While it's easy to make comparisons to bands like My Bloody Valentine, POBPAH have produced a unique record compete with the quality and staying power that assures them a place as one of the best new bands of 2009.
the bird and the bee are not new. They've already accumulated a decent modicum of success due to their self-titled debut released in 2007. 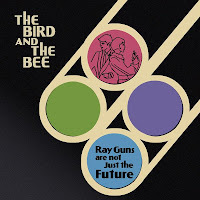 Yet, their follow-up record Ray Guns Are Not Just the Future finds the LA duo finally stepping into their own. There was always something kitschy and sugary-sweet about tbatb. That was part of the appeal. Yet, their songs never really stayed with you. They were fleeting indulgences best consumed in small doses. Yet, all that has changed with their sophomore record. Greg Kurstin's production has never sounded better and Inara George's voice has more of an edge and purpose than ever before. After their debut and two so-so EPs, tbatb have finally delivered the full record critics and fans have been waiting for. 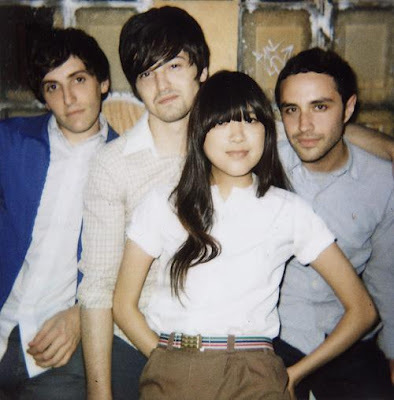 The songs on Ray Guns, most notably the stand-out "Love Letter to Japan" (below), are driven by strong melodies and infectious instrumentation. tbatb sound more mature and self-assured in their music. This new record, coupled with the band's previous success bodes well for a very fruitful 2009. It feels like Dent May has been around forever. His music seems so familiar, yet every time we listen, it's still as great as we remembered. There is an exuberance and joy in May's songs. He's not making any sweeping commentary in his lyrics, nor is he trying to alter the music spectrum with his instrumentation. His music is truly just good feeling music. Every one who listens is instantly a fan, that's the beauty of this record. You can play it anywhere for anyone. Dent May sings casually in a charming croon about drunks, dance parties, and girls. Imagine if Beirut took some Prozac and played at a spring BBQ and you can get a sense of Dent May's sound. May has the look and the attitude of someone who is bound to be a staple on the indie-rock scene of 2009. Discovered by Animal Collective in his home state of Mississippi, Dent May has signed to their Paw Tracks label. 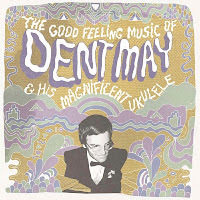 Clearly Dent May has the pedigree for success, but what's so refreshing is that his sound and record all justify the praise and buzz sure to come to him in 2009. He is hitting the road with New Pornographer AC Newman this winter.